JEE Main 2019 Result declared by NTA conducting the JEE Main 2019 across its various test centers. The JEE Main 2019 Result is now available on the official website of NTA. Candidates securing higher rank will be further called for a round of counseling. For checking the JEE Main 2019 Result, candidates will be requiring their application id and password / date of birth. The JEE Main 2019 Result for both the months will be announced separately. Candidates can check this page for information on JEE Main 2019 Result. NTA Declares JEE (Main) January-2019 NTA Score. The first JEE (Main) Examination was conducted by NTA between 8th and 12th January, 2019 in two shifts per day across 258 cities in the country and abroad. A total number of 9, 29,198 candidates were registered for Paper –I (B.E. /B. Tech.) in this examination. There were 467 examination centres across the country and abroad. A total number of 566 Observers, 254 City- Coordinators and 25 State Coordinators were deployed at these centres to oversee the smooth and fair conduct of examination. The Paper-I was conducted in a total of 8 shifts from 9th to 12th January 2019. The results of Paper- I have been declared on 19 Jan.
JEE Main 2019 Result will be released in the rank or score format. Candidates are advised to download their result after viewing it before the link vanishes. It will be available on the official site as per the dates mentioned below. Result Declaration Date 19 Jan 2019 – Announced! JEE Main 2019 Result: Candidates can download their JEE Main 2019 Score from this page. How to View / Download JEE Main 2019 Result? 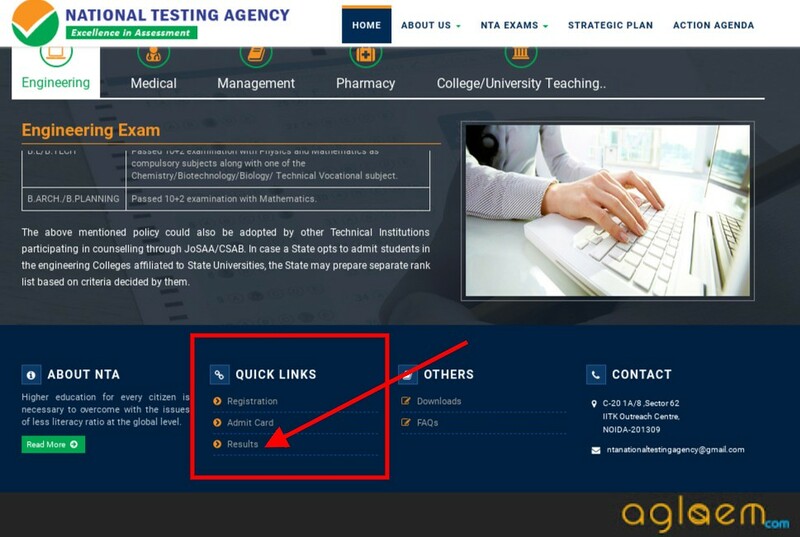 These steps will surely ease out the procedure of downloading your JEE Main 2019 Result. Have a look! Visit the official website or the direct link mentioned above. Scroll down to find the”Quick Links” section from below. There find the “Result” link. ( Note that, this link will work only after its activation). Fill in your details like exam roll number and date of birth as given in application form to view / download your JEE Main 2019 Result. You will finally be redirected to the page where you will find your JEE Main 2019 Rank/ Scorecard. Make sure after viewing your result, you save a copy of it. The JEE Main 2019 Result needs to be carried to the allotted counseling center on the day of counseling. Since, JEE (Main)-2019 Paper-1 first attempt will be conducted in multi-shifts, NTA scores will be calculated corresponding to the raw marks obtained by a candidate as per 2.10.1 (d) above. The calculated NTA scores for all the shifts / sessions will be merged and declared by 31st January, 2019. This shall comprise of the four NTA scores for each of the three subjects (Mathematics, Physics, Chemistry) and the total in Paper-1 of JEE (Main)–2019 for the first attempt. Similarly, JEE (Main)-2019 Paper-1 second attempt will be conducted in multi-shifts, NTA scores will be calculated corresponding to the raw marks obtained by a candidate as per 2.10.1 (d) above. The calculated NTA scores for the Raw Marks for all the shifts/sessions will be merged for further processing. The four NTA scores for each of the candidates in Paper-1 of JEE (Main)–2019 for the first attempt as well as for the second attempt will be merged for compilation of result and preparation of overall Merit List / Ranking.Those appeared in both the attempts; their best of the two NTA scores (total) will be considered for further processing. The NTA scores of both the attempts and rank of Paper-1 of JEE (Main)–2019 for all candidates who appeared in first attempt as well as in second will be declared by 30th April, 2019. You can login your account using details provided in admit card in order to view the scores. This shall comprise the four NTA scores obtained by the candidate in first attempt and four NTA scores obtained in second attempt along with the status of those who qualify for appearing in JEE (Advanced)–2019 provided and subject to other conditions of eligibility being met. The rank shall comprise All India rank and All India category rank. Since, JEE (Main)-2019 Paper-2 may be conducted in single-shift only, the raw marks obtained by all the candidates who appeared in first attempt will be declared by 31st January, 2019. This shall comprise the actual marks obtained in Paper-2 of JEE (Main)–2019 for the first attempt. Similarly, JEE (Main)-2019 Paper-2 second attempt may be conducted in single-shift, the raw marks obtained by all the candidates who appeared in second shift as well as for the first attempt will be merged for compilation of result and preparation of overall Merit List / Ranking.Those appeared in both the attempts; their best of the two raw marks will be considered for further processing. The Total raw marks of both the attempts and rank of Paper-2 of JEE (Main)–2019 for all candidates who appeared in first attempt as well as in second will be declared by 30th April, 2019. This shall comprise the total raw marks obtained by the candidate in first attempt as well as in second attempt along with All India rank and All India category rank. What next after JEE Main 2019 Results are announced? Shortly after the JEE Main 2019 Results are announced based on final answer keys for both the months, the results are handed over for conducting counseling rounds. Candidates are one by one, according to the rank secured called for this round. The higher their rank or score, the sooner will a candidate be called for counseling round. Selected candidate’s results are further allotted seats by the Central Seat Allocation Board. A candidate’s score is matched to the colleges cutoff and that’s how he/she will be allotted a seat in any one of the 31 NITs, 23 IITs, 23 GFTIs or 23 CFTIs. All participating institutes that do not use the Centralized Seat Allocation Process will prepare their own ranking based on the performance in JEE (Main)-2019 and other criteria as decided by them. Only the All India Rank (AIR) is used for admissions through Central Seat Allocation Board (CSAB)/Joint Seat Allocation Authority (JoSAA) to NITs/ IIITs/ CFTIs/ SFIs/ Others, while other ranks are for information purposes. As mentioned earlier after the JEE Main 2019 Results are out, candidates will be able to check the cutoff for various undergraduate engineering courses. The cut off marks vary every year across candidates of the different category. Candidates will be able to apply for the college whose cutoff matches to the rank or score secured by that candidate. The JEE Main 2019 Cut off has not yet been released. You will be able to check the cut off marks from this page as well. Till that time, candidates can have a look at the last year cut off marks for various categories based on eligibility criteria. Its now July 2018.Is there anything yet to be changed regarding jee mains 2019?Are there further announcements to be made? No further announcement made. JEE Mains 2019 forms are expected in first week of sep 2018. Itni kya jaldi thi thodi galtiya to sudhar lete . 30 que. bnane hote he usme bhi itni errors kya karte wo teachers .